If you want a glimpse of old Santa Rosa, don't just cruise McDonald Avenue; stop by Wilson Street, which still looks the same as between the World Wars, when it was the heart of our "Little Italy" community. A recent column by Gaye LeBaron quoted West End chronicler Rita Carniglia Hall, who remembers "...there were shoe shops and barbers and clothing stores and, of course, restaurants and saloons. There was no call to go farther east than St. Rose Church." Italian kids often didn't even venture the few blocks to downtown until they were eight or ten, LeBaron wrote in her history of 20th century Santa Rosa. It was as if they lived in another town. On the corner are two survivors of the 1906 earthquake. To the right is the Redwood Gospel Mission, which is in a heavily modified Victorian that was once both a saloon and grocery store owned by Batiste Bettini - the same man who built the La Rose Hotel a block further down after the earthquake. There were other saloons in the Italian District around Adams Street between West 6th and West 7th, but let's move on - this ain't a history of Little Italy. On the other side of Wilson St. is a long brick building that occupies the entire block. The section near the intersection of Sixth St. is newer, as you can easily tell by looking at the brickwork. The rest of the building dates back to the 1890s and was part of the flour mill. 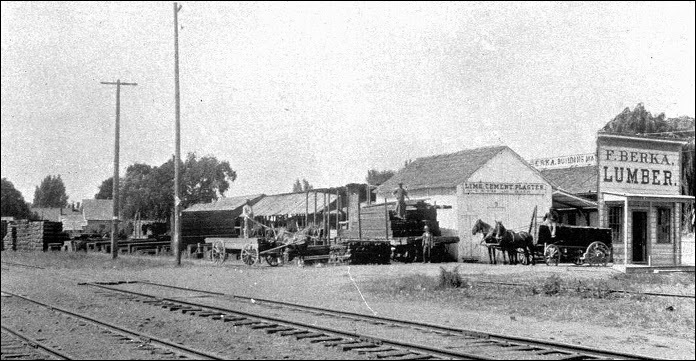 The part of the mill closest to the railroad tracks collapsed during the Great Earthquake, but was up and running again within five months - hopefully with a more hygienic crew (see picture). Around WWI it was bought by Sperry Flour Company, whose name is still seen on the south side of the building. Proceeding to the middle of the block, (tap or click on the Google street view "forward" arrow to follow along) the nice little building at #512 was built for Oreste Paolini in 1920 and was where he sold men's clothing until he died, sixty years later. Paolini's finally closed in 2007, the last survivor of the old Wilson St. Italian business district. The red brick building next to it was built in the late 1920s for small storefronts. The developer is preserving, however, the corner building at 701 Wilson (currently offices for Copperfield's Books), which has been deemed "historic," although it was built in 1947 and is spanking new compared to anything else on the street. This was the retail store for the lumber yard and was designed by Santa Rosa architect Cal Caulkins. Its style is "International Style Modern" which was a descendant of Art Deco, minus any charm whatsoever. You see these plain stucco boxes with rounded corners and glass brick "windows" so often in Los Angeles that I have joked the style should be renamed "Sepulveda." Our tour ends with mention of three buildings: On the corner of Wilson and Ninth St. is a little building that currently houses "Gotta Grow Garden Supplies." Although it faces Ninth, it has a 769 Wilson St. address because there was once an Italian grocery facing Wilson on the same lot. Across from the lumber yard is a large storage barn with a sliding red door, which was also part of the lumber yard and built around 1910. And next to it, at 726 Wilson, is the neat little bungalow that was built in 1926 for grocer Albert Trombetta. There are other residences from there to the corner that also date from 1906 and the 1920s but nothing is apparently documented. 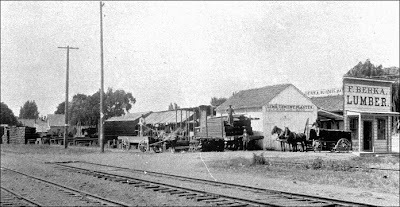 Santa Rosa's 1989 Cultural Heritage Survey called all of this the "North Railroad District" and found it might stand by itself as a candidate for the state and national Register(s) of Historic Places as a mostly untouched historic commercial-industrial district, similar to Railroad Square. Nothing was done, although it was given a classification status that meant it was supposed to be reevaluated sometime after 2003 (it wasn't). The town's Cultural Heritage Board ignored the issue and folded part of Wilson St. into the West End Neighborhood as a nod to its historic ties to the Italian community. But apart from being the Italian district and warehouse district, this three block stretch of Wilson Street had yet another important historic identity: The homeless district. Today Wilson Street is well known as the home to those suffering the hardest of hard luck. At any time of day at any time of year, people can be found loitering about or dragging their heels down those sidewalks. The soup kitchens are the draw; between the Redwood Gospel Mission and St. Vincent de Paul, the hungry and destitute can eat three meals a day and just maybe sleep inside for a night. And so it was, more than a century ago. The little article transcribed below shows that a "Rescue Home" was being established in 1910 at the corner of Wilson and Eighth as a companion to the "Rescue Mission" two blocks away at Sixth and Washington Streets. That homeless missions were there 100 years ago raises questions: Why were these services located close together in this neighborhood and not somewhere else in Santa Rosa? Does it mean there was a homeless population already established in the neighborhood around Wilson Street prior to 1910? Very probably so, but it's unlikely we'll ever know for sure; rarely did historians - or local newspaper editors - care about reporting anything happening in the world of the homeless. And so it has continued into modern times. Besides the Redwood Gospel Mission (founded in 1963) and St. Vincent de Paul, we know there was also a "House of Refuge" at one of the buildings on the corner of Wilson and Ninth as recently as forty years ago - but we only know that because it was stumbled upon by researcher Diana Painter looking at Assessor data for the developer. And there must have been others, particularly during the desperate years of the Great Depression. Likely homeless charities have continually been a significant presence on Wilson Street, but the details are lost as part of this shamed and shunned page of history. The 1910 shelter was a "Dorcas" project, and even that heritage is a little murky. In 1874, the Seventh-day Adventist Church adopted the name "Dorcas Society" for its community initiatives, but there was a long history going back to 1811 of charitable women's groups and domestic evangelicals in America that were all named after a woman in the Bible. At times it was also strongly associated with the African Methodist Episcopal (AME) Church and sometimes with ladies' auxiliaries of Masonic Lodges. During the Civil War there were Dorcas Societies that sewed uniforms and underwear for Union soldiers. Presumably the charities in Santa Rosa were Seventh-day Adventists since Mrs. Stumph below identifies herself as an evangelist, but we can't be sure. So in the end, there are three sides to Wilson Street. On the west are a looming trio of long buildings that once were teeming with busy workers, but now only serve to keep the street shadowed from the afternoon sun. On the east side are the boisterous ghosts of Italian barbers, cobblers, green grocers and children who don't know (or care) about the world outside. And in the stray corners are found the homeless, always invisible, there always. In connection with the Rescue Mission on Washington street we are opening a Rescue Home at 117 Eighth street, between Davis and Wilson streets. In doing this we seek to provide, not an institution, but a real home, devoted to the material welfare, the moral uplift and spiritual life of the stricken in body, victims of drink, outcast, hungry and friendless, the "down and outs." We desire to give a temporary home, food and clothing, when needed; to point these unfortunate ones to the Christ; help them to gain employment and become honest, respectable citizens and members of society. Little children also will be received in an adjoining cottage. We are in immediate need of a stove, beds, cots, tables, chairs, matting, bedding, towels, blinds, dishes, food supplies, groceries, fruits in jars, etc. Any new furniture or that has been used gratefully accepted. Send us a card or telephone No 669R. Evangelist and Mrs. N. Stumph. This afternoon at half past two o'clock Mr. Gibson of Oakland will deliver a sermon at the Rescue Mission at Sixth and Washington streets.